Offering you a complete choice of products which include telesis benchmark 200 benchtop marking system, telesis tmp3200/470 single pin marking system and tmp 1700e electrical bench top markers. 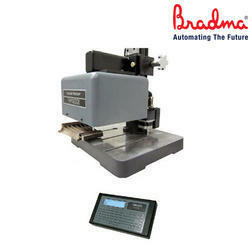 The BenchMark®200 is an extremely economical, fully programmable alternative to old-fashioned permanent marking techniques. This complete system, with self-contained controller and extruded aluminum marking head mounting post and base, is the right choice for many stand-alone bench top marking applications. An electromechanical marking pin eliminates the need for any air supply, making it easy to move the BenchMark® 200 from one work area to another. The PINSTAMP® TMP3200/470 Single Pin Marking System features a large 4˝ x 6˝ (100mm x 150mm) marking window, and marking speeds up to six characters-per-second. Well suited for both bench top and factory-automated applications, its simple, yet robust belt-driven dual rail, X/Y platform yields high quality characters and low maintenance operation. Leveraging on our in-house production unit, we are presenting a wide assortment of TMP 1700E Electrical Bench Top Markers. These markers are used in various industry applications. The offered markers are manufactured using stainless steel metal alloy and progressive technique. 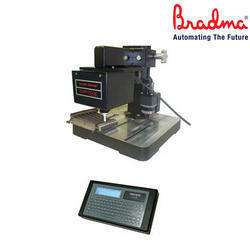 Furthermore, the markers are tested on various quality parameters such as dimension, length, finish and fastening. 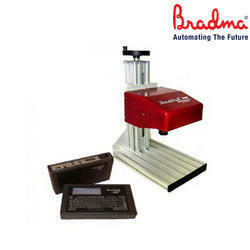 Apart from this, clients can get the markers from us at industry leading rates. Self-Contained, state-of-the-art TMC470 controller features two serial ports, USB port, and Ethernet port.